Yooralla’s Employability Program is focused on building your job skills to support your pathway to employment. We can tailor a job skills program to suit your individual needs and capabilities and support you to transition into the job that is right for you. Yooralla will work with you to develop a training plan which will include the learning outcomes you want, your work goals and how you will achieve them. Employability: Preparation for Work is a two-year education and practical job training program, including work experience, specifically for school leavers and individuals who require intensive support. Learn more about Employability: Preparation for Work. Employability: Job Ready is the next step up, for participants who have completed the Employability: Preparation for Work stream, or people who are at the supported employment level already. This is an additional year of paid on-the-job training based in a Yooralla Business Enterprise or in the community. Employability: Job Ready can prepare the participant for moving into open employment. Learn more about Employability: Job Ready. After completing the Employability: Job Ready stream, you may want support to move into ‘open employment’— that is, a job in the community, where you no longer need support to do your job. 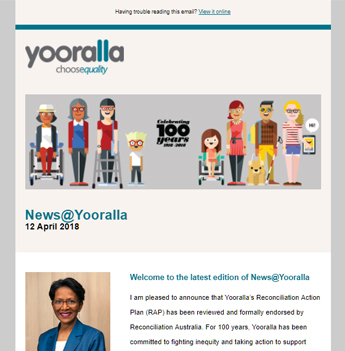 Learn more about how Yooralla can support you to transition into open employment. Learn more about Open Employment. Build everyday life skills to achieve more independence, confidence and control. Adaptable community-based programs where you can access learning, recreation and social opportunities.